Degenerated discs are a common back problem. 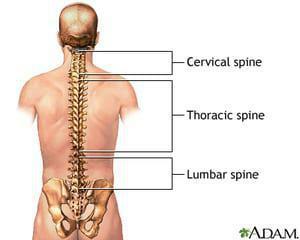 The spinal discs, which are soft, gelatinous cushions that separate the vertebrae, wear down during the aging process. Because the discs function as between-the-bones shock absorbers, allowing the spine to bend and twist, this deterioration can result in serious back pain. As discs are damaged or wear away, the amount of space between the vertebrae gets smaller. As the space narrows, joints are placed under greater stress, resulting in further degeneration. An acute injury to the back also increases the potential for disc degeneration. Compression of the spinal nerves can cause symptoms that include tingling/numbness, muscle weakness, loss of balance/ coordination, and pain and stiffness. Back pain is often worse when sitting, lifting, bending or twisting, and walking or lying down typically helps alleviate the pain. In order to diagnose a degenerated disc, a physician takes a medical history, and performs a comprehensive physical examination that includes checking for numbness or weakness, and testing reflexes to determine whether any muscles have atrophied. Several imaging examinations may also be administered; they include X-rays, to assess spine alignment; MRI scans, to observe any compression of the spinal cord; and CT scans, to evaluate the size of the spinal canal and visualize bone spurs. A myelogram, which uses contrast dye for improved visualization during X-rays or CT scans, may also be administered. Any of these complications can worsen the patient's condition. In many cases, nonsurgical options provide a patient with relief from a degenerated disc. Bed rest and anti-inflammatory medications can help decrease swelling and pain. If the affected disc is in the cervical region, a soft collar can limit range of motion, and alleviate pressure on nerve roots. Physical therapy may be recommended to stretch and strengthen the muscles of the abdomen, back and, possibly, the neck. Epidural injection of corticosteroids can help to reduce swelling, and greatly relieve pain in the affected area. A relatively new form of minimally invasive treatment is intradiscal electrothermal therapy, during which a catheter with a heating coil is inserted through a needle into the affected disc. The heat strengthens the collagen fibers that hold the disc together, strengthening tissue while destroying excess nerve fibers. Intradiscal electrothermal therapy is often successful in decreasing damage and pain. If a patient's back pain does not respond to these conservative treatments, surgical intervention may be required. If a disc has become herniated and is pressing on a nerve, a discectomy may be recommended to remove the disc entirely. The removed disc may be replaced by a synthetic disc that can restore shock absorption and improve mobility between vertebrae. In more severe cases, spinal-fusion surgery, which involves removing the disc and fusing the nearby vertebrae to increase stability in the spine, may be performed.